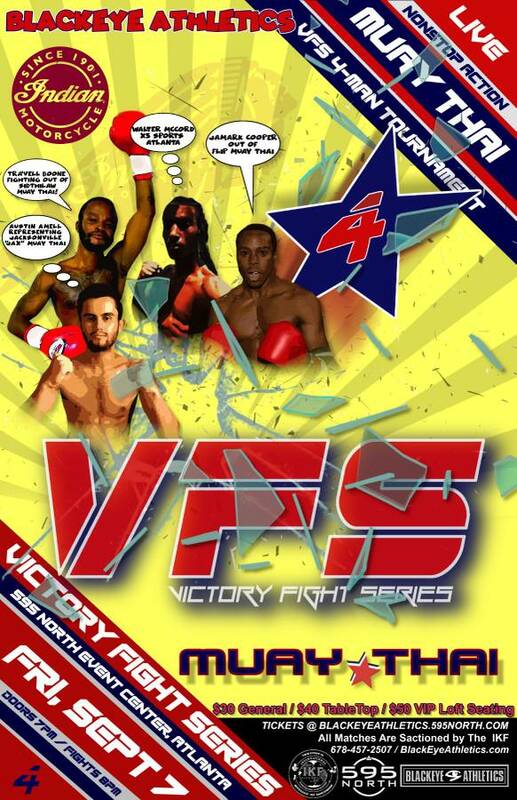 On September 7, 2018 BlackEye Athletics (Bryan Keith) & International Kickboxing Federation (IKF) will host Victory Fight Series - Lightweight Four-Man Tournament. Come witness the very best Lightweight Muay Thai fighters in the Southeast fight in a full rules Muay Thai, single-elimination tournament. Walter McCord, of X3 Sports, Austin Amell or Jacksonville Muay Thai, Jamark Cooper of FLIP Muay Thai and Tra'vell Boone of Sidthilaw Muay Thai will battle for the IKF Southeast Region Title! Also, in the co-main event we will have a rematch of two tough and game fighters in Melvin Moore or Trammell Fitness and Martial Arts vs Tre'ston Vines of Kage Fit who will fight for the IKF Interstate Light Heavyweight strap. This will be the first event of its kind in Atlanta, and will set the stage for national, world and international competition.